Boat Description The 640 & 630 Pilothouse are two fully-equipped fishing machines.Both 630 and 640 are equipped with Navman 4150 Black & White Fishfinder.The outstanding design of the 630 Pilothouse includes a new sliding door, a level deck between the steering station and the generous cockpit, plus a range of fisherman-friendly facilities. 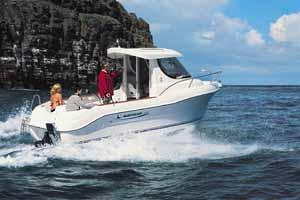 When fishing is your passion, the 640 Pilothouse and the 630 Pilothouse are your means. Every serious fisherman knows that his boat is as critical a piece of equipment as his fishing rod. If either one isnt up to the task, it puts the days catch at risk. And there can be few greater disappointments than seeing a trophy fish get away because of substandard material. Thats one thing that you wont have to worry about with these Quicksilver boats.The 630 Pilothouse is also available in a diesel sterndrive version.